Italians like coffee. Correction Italians love coffee. 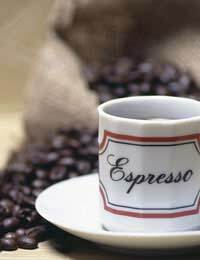 So much so that they consume 14 billion espressos every year and account for 3.7 kilograms of the stuff per head. From all those beans, coffee bars are selling on average 230 cups a day of which almost 60 percent are espressos and 13.5 percent cappuccinos. So much information to take in, but perhaps the most interesting figure is the relatively small number of cappuccinos being consumed on a daily basis, because of all the types of Italian coffee that are available, it is the shallow cup of espresso covered in a hood of steamed milk and perhaps a dash of chocolate powder on top that has become the symbol of the way that Italians consume their coffee. However, the cappuccino is very much viewed as a drink to be taken first thing in the morning, after which the espresso becomes de rigueur. Certainly the latter is the undisputed king of the after-dinner table, and with good reason. A small bitter shot of arabica beans, or a blend of arabica/robusta is guaranteed to get the digestive juices flowing. However introduce a measure of frothy milk in the form of a cappuccino and your guests are going to find their full stomachs suddenly feeling rather queasy - nothing to do with your cooking, of course! So restrict your cappuccino drinking to accompanying a morning cornetto, or croissant. And while we're laying down the law, do not under any circumstances order a corretto before at least 11am. Well, not unless you want to elicit pitying glances from your near neighbours at the bar. Like espresso, corretto should be restricted to after dinner, consisting as it does of a shot of espresso “corrected”, or should that be “pepped up”, with a measure of liquor such as grappa or vecchio amaro. If stopping during the course of the day for a quick espresso at the bar, either to chew the fat, or dilute the taste of the fat from the barman's rather second-rate panino prosciutto, there are a couple of variations on the theme worth taking a shot at macchiato and stretto. Macchiato translates as marked or stained, in this case the deeply dark surface of the coffee being pierced by a dash of steamed milk. A stretto is a lot more macho than a macchiato, consisting of the same amount of ground coffee as an espresso but with less water to provide a thicker consistency and, shall we say, more intense caffeine experience. As well as these more serious forms of coffee consumption, customers can opt for a freddo, or iced coffee, when the Italian sun begins to make its presence felt, or a latte, which like cappuccino involves a combination of a shot of espresso and milk, but in this case the two are mixed rather than presented as separate elements. Finally, for northern European or visitors from across that Atlantic who find all these a little strong for their palate, most bar owners will serve an americano, which again consists of an espresso shot but diluted in a large cup of hot water with a portion of milk provided in a little jug. Ristorante, Trattoria, Osteria: What's the Difference?